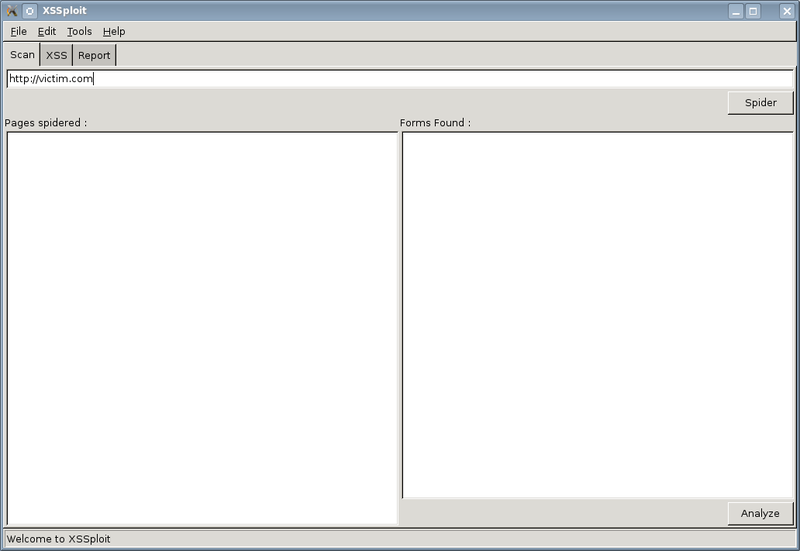 When used against a website, XSSploit first crawls the whole website and identifies encountered forms. It then analyses these forms to automatically detect existing XSS vulnerabilities as well as their main characteristics. The vulnerabilities that have been discovered can then be exploited using the exploit generation engine of XSSploit. This extensible functionality allows choosing the desired exploit behaviour and automatically generates the corresponding HTML link embedding the exploit payload. xssploit.py: The main file. Contains the XSSploit core and the command line interface. extensions.txt: XSSploit’s spider crawls web pages using REGEXPs. This file contains the file extensions on the server that should be spidered. To add a new extension, simply add a new line in this file and write your extension. Don’t forget the dot. exploits.xml: The exploits database. Please refer to this file to create new exploits. report.xsl: This stylesheet is a very basic example on how to display the report generated by XSSploit. Put this file in the same folder as the XML report and point your browser to the report file to see the report.